Sidney H. Griffith is Professor Emeritus in the Department of Semitic and Egyptian Languages and Literatures in the School of Arts and Sciences at The Catholic University of America, Washington, DC. He has lectured and published extensively in the areas of Syriac Patristics, Christian Arabic Literature, and the history of Christian-Muslim Relations, focusing on the Early Islamic period and the Islamicate World. Cornelia B. Horn is a senior research associate at the Institute for Christian Oriental Research (ICOR) at The Catholic University of America, Washington, DC, and a Heisenberg Fellow at Freie Universität, Berlin, Germany. She studies interactions between Jews, Christians, and Muslims in the Middle East and the Caucasus. modern life and thought in all its dimensions. With discussions of Satan’s role in Adam’s Fall in Islamic and Syriac Christian traditions, stories about Aaron’s death, Jewish and Christian stories concerning the matriarch Sarah or interpretations in poetry and prose of the role of the Psalms, with reflections on the spiritual memories of paradise in the Odes of Solomon, or Manichaean magic, only to mention a few of the topics, this book will take your imagination and insights into new depths and to new heights. Scholars from the Middle East, South Africa, North America, and Europe—Tammie Wanta, Herrie van Rooy, Jason Scully, Ben Rosenfeld, Ilaria Ramelli, Robert Phenix, Rebekka Nieten, Giulio Maspero, Aryeh Levene, Cornelia Horn, Angela Harkins, Sidney Griffith, Craig Blaising, and Gaby Abousamra—contribute new evidence and foundational reflections to understanding the diverse relationships between Islam, Christianity, and Judaism. 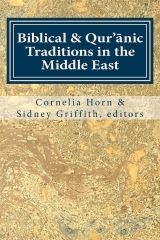 The seeds for this volume’s articles were laid at the gatherings of scholars of Syriac Studies at the SBL conferences in New Orleans, Atlanta, San Francisco, and Chicago between 2009 and 2012 and in the context of subsequent international, collaborative projects. As Sacred Scriptures for the believers, the Hebrew Bible, the New Testament, and the Qur’an guide and inspire billions of faithful women and men across the globe. One of the exceptionally fruitful contexts in which the reception, interpretation, transmission of, and engagement with these holy texts flourished was in the Syriac- and Arabic-speaking milieux. The articles in this volume illuminate once more the critical contribution of Syriac Studies more specifically, and Christian Oriental Studies more generally, to understanding important aspects of reading and hearing Jewish, Christian, and Islamic sacred texts in historical contexts. They open the reader’s imagination to the contribution of the Middle East for the cross-fertilization of these sacred texts and their interpretation and reception. This book is the second volume of Abelian Academic’s new series : Eastern Mediterranean Texts and Contexts (EMTC). This series takes its readers on journeys through Eastern Mediterranean time and space. Its cutting-edge research illuminates foundational aspects of this formative region of the modern world. Geoffrey Greatrex, Sidney H. Griffith, Cornelia Horn, Guita G. Hourani, Basil Lourie, Robert R. Phenix, Hagith Sivan, and Cynthia Villagomez serve on the series’ editorial board. Upcoming volumes, to be published in 2016 and 2017, will include chapters by Predrag Bukovec, Vicente Dobroruka, Mats Eskhult, Carl Griffin, Blake Hartung, Cornelia Horn, Stanley F. Jones, Robert Kitchen, Tuomo Lankila, Basil Lourie, Robert Phenix, Ilaria Ramelli, Erga Shnerson, Herrie van Rooy, Cynthia Villagomez, and Helen Younansardaroud, among others.